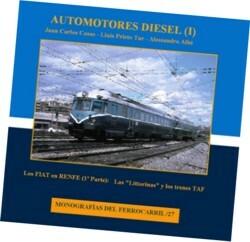 First volume of the series dedicated to the automotive diesel, this time, the first part of the work dedicated to the Italian automobile manufactured by FIAT for Renfe, automotive littorinas called, and the famous trains TAF. The technical effort done by FIAT in the decades of the forties and fifties was rewarded with a large presence of its vehicles in the Italian railway network, and with exports lasted until decades later. Fruit of the wide range of types of trains 'Littorina' are our twelve vehicles of the same nickname, taken by North and MZA / Renfe. The evolution of littorinas appeared in our country as TAF units in different batches and types of vehicles. An international look at the productions of the Italian manufacturer, to his own career as a company, and an extensive technical section, historical and personal service to both types of trains on our rail network make up the bulk of the book. Complete with a summary in Italian and an annex color photography.